Dr. Jamal A. Khan has been a researcher and teaching faculty at the Jawaharlal Nehru Medical College at Aligarh Muslim University, from 1997 till 2005. He left his job to pursue his research interest in immunology and more particularly, cancer. He set out to develop a treatment modality for cancer patients based on revival of immunology. 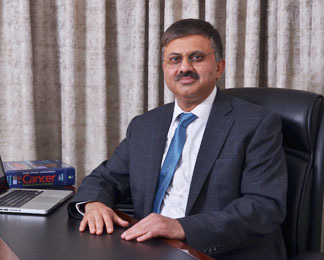 He set up his clinic in Noida, in 2005 and began to work in cancer immunotherapy, using patient’s own immune cells. With the ethical committee’s permission to start treatment, a press meet was organized to inform patients. Only advanced disease patients, who had exploited all means of treatment and resistant to conventional therapy, were enrolled for the customized immunotherapy plan. Because of the autologous nature of the therapy, few to negligible side effects were observed. The treatment proved to be useful in improving quality life for the advanced stage patients, and became a good treatment modality in palliation. Gradually, observing the safety and efficacy of the therapy over a period of years, early stage patients were also advised to help prevent relapse and improve survival. He set up the company, Institute of Cellular Therapies along with his wife Dr. Sharmin Yaqin, in 2007. He named the therapy Denvax, based on the nature of cells used to generate robust immunity, the dendritic cells. Dendritic cells are cells of the immune system which have the key role of antigen presentation. They help in passing the vital information of killing the cancer cells, to T-cells, the effector cells of the immune system. In cancer, it is this link of passing the information that is missing, and that is why the disease. Dr. Khan also developed a method to collect and store the patient’s blood for long hours preserving their viability for 19 hours. This nutritional medium is called CellNute, used to collect blood for patients who are distantly located. He chaired scientific session on Cancer Immunotherapy in World Cancer Congress, Geneva in August 2008. He has also presented papers in ICON Mumbai, September 2009, and The Indian Cancer Congress, Bhubaneshwar, 2011. He also spoke on Cell Therapies, at the Indian Medical Tourism Destination, Africa 2011, held in Nairobi, Kenya, on March 17-18th. Dr. Khan has attended the 102nd Annual Meeting of American Association of Cancer Research: Innovation and Collaboration- the path to success, in Orlando Florida, USA, held on April 2-6th2011. He is also developing Optimum Medical Center LLC in Sharjah UAE, under the guidance of Honourary Sheikh Khalid Qasimi member of the ruling family of Sharjah Emirates. The vision is to provide dendritic cell based therapy for cancer patients in UAE and the Gulf region and start a training center for local and international students.